Rummikub is the family game that’s never the same. 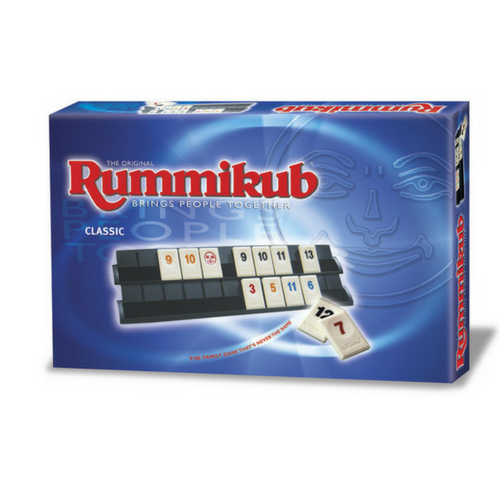 Rummikub provides hours of amusement, where each game is as different as the combinations of moves your choose to play. Be the first to go “Rummikub” by using all tiles in “Runs” or “Groups” and accumulate the highest score. Outwit your opponents with strategy and sharp moves to win. Use the “Joker” to fire up the game, but beware if you are still holding onto him at the end of a round then you lose 30 points! Contents: 106 tiles (8 set of tiles 1-13 in 4 colours and 2 Jokers), 4 racks and rules. Rummikub is a registered trademark of Hertzano.